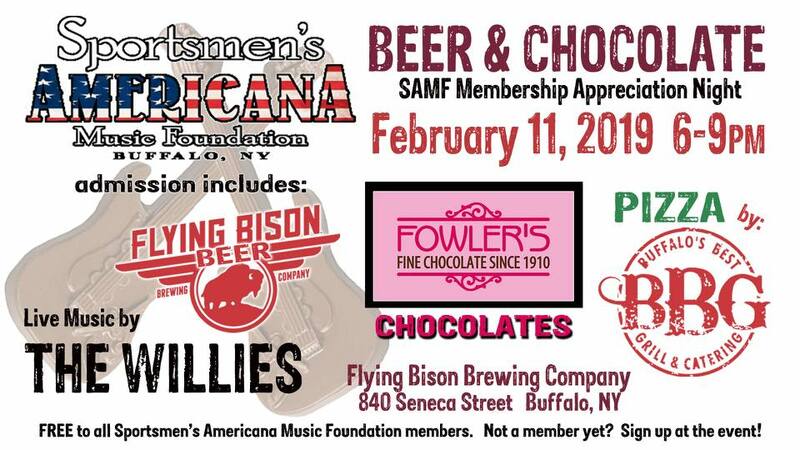 The Sportsmen’s Americana Music Foundation’s Annual Membership Appreciation and Membership Drive event, Beer & Chocolate takes place on Feb. 11 from 6 p.m. to 9 p.m. at Flying Bison Brewery. Music will be provided by The Willies! Members get in free and are gifted with beer, chocolate and great music. There will be pizza from Buffalo’s Best Grill to munch on and chocolates available to purchase for your sweethearts. We encourage you to bring others who love Americana Music. It’s a great place to sign up and have some fun!